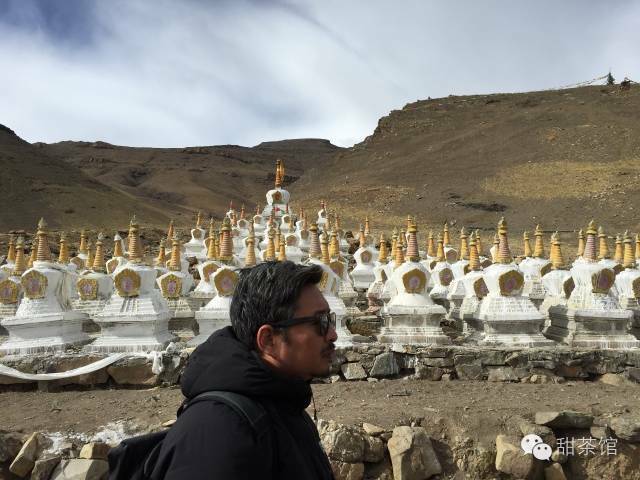 In the interview, Gade talks about his new joint venture with fellow artist Nortse, the “Scorching Sun Art Lab” in Lhasa. He explains how the name for the art lab came from the contemporary Tibetan art exhibition, “Scorching Sun of Tibet” which was held in Beijing in 2010. The “Scorching Sun Art Lab” is one of only a handful of independent art spaces in Lhasa since the Gedun Choephel Artists’ Guild was founded in 2003. Read some thought-provoking comments from scholar Clare Harris about Tibetan participation in art infrastructure in this interview. Read also an interview with young Lhasa-based photographer Nyema Droma who runs her own space, Himaalaya Studio, here. First, I would like to know a bit about yourself; how did you get involved with art? I liked drawing and painting from a very young age; I always thought I would become a painter, my goal has always been very clear and I was lucky that at every stage of my career I happened to meet a good teacher. I forgot who said this, but “a person who manages to do what he or she dreamt of doing as a child is a happy person”. I feel that I am really happy, I have always been doing what I like most. I have three teachers who I need to thank: Mr. Han Shuli, Mr. Yu Xiaodong and Mr. Li Xianting. They gave me the most important and most effective guidance during crucial periods of my artistic life. When I look back at my past works, I feel ashamed to have to say that I was once their student. As one of the representatives of contemporary Tibetan art how do you define “contemporary art”? I only represent myself (laughs). Contemporary art is “truth”! The definition of contemporary art is not really related to time; in other words, we cannot say that any art that is produced in the present is automatically contemporary art. It is first and foremost an artistic approach and cultural standpoint. Genuinely confronting one’s own immediate experiences, feelings and living environment is the most important approach of contemporary artists. You need to express the things and events that you yourself have encountered, you have to express the real situation. In the past, we would never paint our own life experiences, because that would be too subjective. For instance Tibet, what is Tibet? Everyone has different ideas and different experiences and it is precisely these different elements that make up Tibet; it is not simply “the white clouds in the blue sky,” “the snow mountain and the grasslands” or the “beautiful Buddhist temples”. People from our generation are highly detached from our culture and mother tongue. 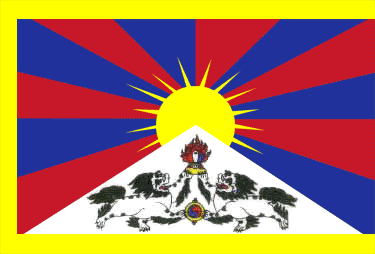 After having been cut off from our spoken and written language as well as from our culture and history, can we really say that we represent Tibet? Early on, I would also paint a mystified Tibet, would contribute to the “Shangri-La-isation” of Tibet, would essentialise Tibet, but then I gradually came to think that this was fake. “Othering” Tibet is bad, but even worse is when Tibetans themselves “other” Tibet. Our own pieces of art are completely unrelated to your and my lives. This is why contemporary art has given me a voice; it is a tool that I can use to get as close to the truth as possible. –But there are still traditional elements in the techniques adopted by contemporary artists, right? –Yes, in my case this has always been true. I have always tried to bring traditional Tibetan art into a contemporary art context; I am still deeply fascinated by traditional Tibetan art. The attention to detail used in the techniques and the ability to create narratives is still very enchanting. These elements are not so important in western or Chinese art and I really want to continue this complex art of storytelling because it helps to express my intentions. It originated from an ancient language system, the so-called “native language system” of Tibetan art, which still exudes great vitality, only that it was broken off and has never been fully revived. The art history of any culture tells us that the evolution of art always begins and develops from one’s very own cultural root. This is why contemporary Tibetan art must by no means become a recreation of western contemporary art. It has its very own language and value system. In 2003, you collaborated with a few other local artists and initiated the “Gedun Choephel Artists’ Guild”, how did you come up with this name? How was Lhasa’s artistic atmosphere at the time and how did society look at contemporary art? Gedun Choephel was a very cool person, it is hard to believe that during these times that such an unconventional Tibetan could exist. Many of his ideas would be regarded as revolutionary and avant-garde even today. I would regard him as the pioneer of Tibetan artistic and cultural enlightenment. For us, he is a symbol, a spiritual guide. His name is just so suitable for us. The artistic atmosphere in Lhasa was still quite good back then. It wasn’t so commercial yet. Everyone was young and passionate, we would often get together and fool around, it was a good artistic spirit. The level of acceptance in society was also quite good. There was no WeChat yet, you know, haha… not many people knew about us, most people who came to exhibitions were from our close circles, they knew what to expect. Today, on the other hand, it is really a little bit frightening how everything is disseminated via WeChat and Weibo; everyone knows everything and it is easy to become extremely popular. But today, there are also so many opinions and voices, even attacks and abuse from fellow Tibetans. I never experienced this in the past, but I have got used to it. We will even get attacked for eating KFC, won’t we?! 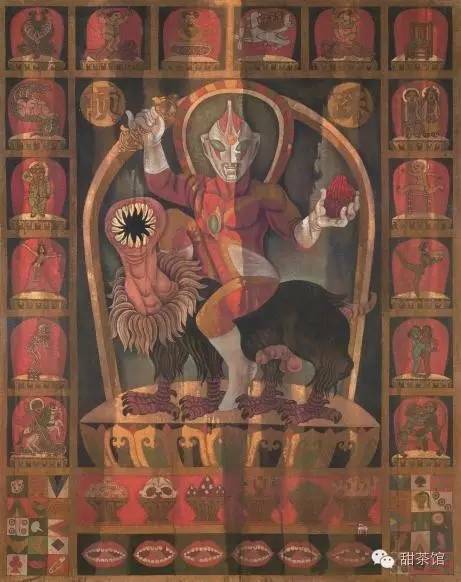 “Making Gods”, 2011, “I would really like to know what a thangka without religious meaning looks like. On the other hand, in this era of globalisation, the deities that are of real use are not those in the temples, but those brought to us by the mainstream culture of globalisation; there are all kinds of “outside deities”, which is why I used various global cultural symbols to create this new deity. Can we regard today’s “Scorching Sun Art Lab” as the continuation of “Gedun Choephel Artists’ Guild”? What has been continued and what is new? Yes, we could call it a continuation. “Gedun Choephel” has been around for 13 years, but it has always been a somewhat loose group. The ideas of some of the members have also come to differ over time and when there are too many conflicting opinions, it becomes difficult to do anything. This is why Nortse wanted to independently run an art space to realise some of his own ideas without having to consult with everyone else first. He wanted me to support him which is why the two of us started the “Scorching Sun Art Lab”. But of course both of us will also always be members of “Gedun Choephel”. In fact, the first exhibition that we organised at “Scorching Sun” was the “Gedun Choephel Artists’ Guild 13th anniversary exhibition”. “Scorching Sun” is not only a platform for contemporary Tibetan art, we are hoping to express a more diverse range of ideas through it. We also hope that “Scorching Sun” will not become too big and commercial. “Gedun Choephel” hosts many professional artists, the exhibitions are bound to be commercial and the market forces us to make compromises. “Scorching Sun” is small and has little expenditures, it is located in our own place and so we don’t have the pressure of paying rent, which is why we can just do whatever we want to do. It gives us more freedom. When Nortse and I want to do something, we do it and if it goes wrong, we don’t impact other members. “Scorching Sun” doesn’t only provide a space for members to exhibit their works, it is also open to young artists; we accept all good pieces, provide a space and help them become popular. Our motto is to maintain a high standard, even if that means that we only have one exhibition per year. If the standard is too low, we would rather not do it. And there is no loss if we simply keep our doors shut. So, this space gives as an opportunity to exhibit more outstanding, experimental and forward-looking pieces of art. At the same time, we also hope to get Chinese or even international artists to give lectures, stay and paint or exhibit their works here. It is an opportunity to promote communication between different contemporary artists. For this, we secured the full support from Liao Wen. Owing to her help, we have already managed to cooperate with 10 Chinese contemporary art organisations and are gradually promoting further communication and cooperation between Tibetan and Chinese artists. But at this point, we are still at the trial stage. At this point, the entire project over here is supported and financed by Nortse and myself. Both of us like it, which is why we do it. I always say, when you have no expectations, you will not be disappointed. We have never applied to any foundations for extra funds. It has always just been the two of us. It is difficult to say how long we can keep doing it. I just hope that we can do it as long as possible. –Have you ever thought about charging for exhibitions or asking for financial help from external sources? –All our exhibitions are free for the general public. We have thought about asking for external financial help to continue to operate this space, but we don’t have any commercial motives. What we are worried about is that if we do take money from other people, we will restrict ourselves and compromise our degree of freedom. This is why we are extremely cautious when it comes to seeking external financial help. –Where does the name “Scorching Sun” come from? –“Scorching Sun” is the transliteration of the Tibetan word ཉི་བཀྲག (nyi bkrag meaning “scorching sun”). Nortse came up with it. Originally, I suggested to simply call us “Scorching Sun” because our previous exhibition “Scorching Sun of Tibet” was very successful, it left a deep impression on many people in China, I thought it would be good to continue using this name. But Nortse wanted it to have more of a “Tibetan flavour”, so we used “nian zhe” (念者), which is the Chinese transliteration of the Tibetan. But the two characters have no specific meaning. 2016 marks the 13th anniversary of “Gedun Choephel” and simultaneously the birth of “Scorching Sun Art Lab”. Your first exhibition in the latter followed the theme “Journey from the Heart”, why did you pick this theme? As I just said, I hope that the pieces exhibited in this space will express the innermost truths and ideas, starting from the heart, we don’t want anything fake. In fact, regardless of whether it’s “Scorching Sun Art Lab” or “Gedun Choephel”, the principle of contemporary art must be: truth! Over the past 13 years we always fantasised as to what art could change, but eventually the truth always pulled us back into reality. Subsequently, we would always regress, regress and regress even more. Even though we worked hard, we worked in the wrong direction. On a different level, the theme had a second meaning, namely that of a new beginning, a new direction. 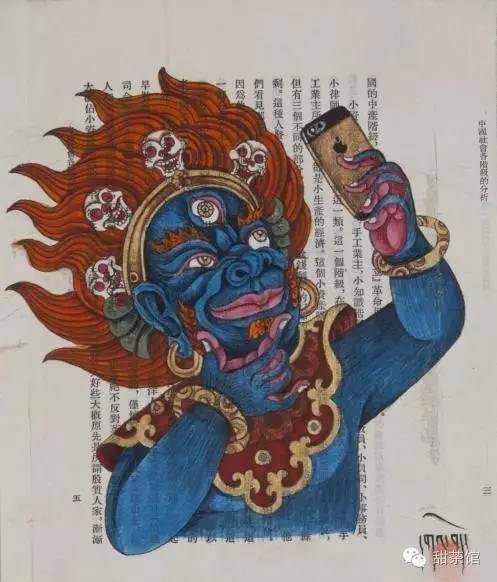 Speaking of Tibetan paintings, they often give people the impression that they are just thangka and murals in monasteries, but you and other contemporary artists use modern techniques to convey traditional culture while also reflecting contemporary society. You in a sense fill a gap in Tibetan art by expressing yourself and adding a modern component. 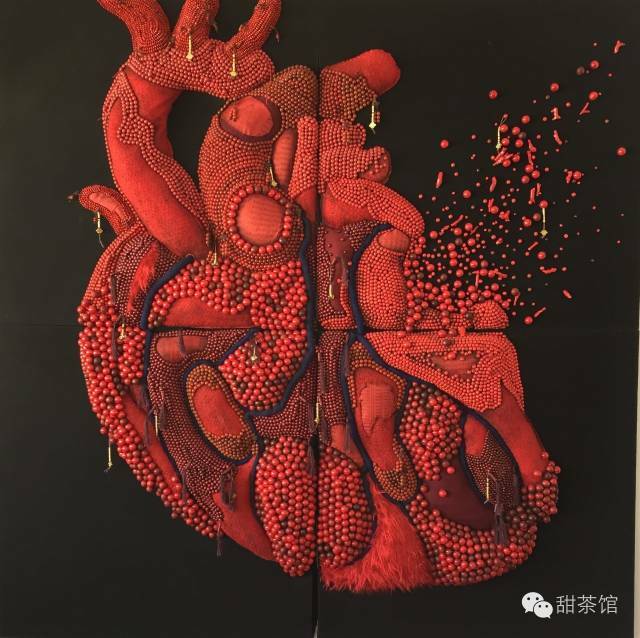 So I would be interested in hearing what you say about the current state of contemporary Tibetan art and also its future. The current situation is not very ideal. Firstly, the general environment is not good and secondly, the contemporary art market is crumbling, it is nowhere near as good as before 2008, when it was flourishing. Many people are simply making a run for it, trying to throw themselves into other artistic domains that have more promising markets; and we cannot blame them. But from a different perspective, all this is also positive, because it makes the opportunists retreat, leaving behind those who really like and care about this profession; it is a cleansing process, which isn’t bad. As for the future, I am really not able to make any predictions. I heard that you signed a contract with the famous art gallery Rossi & Rossi that collects art from the Himalayas. Can you tell us a bit more about your relationship with them? Rossi & Rossi is a British art collector and dealer specialising in traditional Tibetan Buddhist art. I was introduced to Fabio Rossi by my American friend Ian. The first piece of contemporary art that he bought was my work. Subsequently, he provided some space to promote contemporary Tibetan art. We have been cooperating for over 10 years, opening up an international market for contemporary Tibetan art. Rossi & Rossi are the nationally and internationally leading gallery in systematically promoting contemporary Tibetan art. Two years ago, they set up a gallery in Hong Kong. Thanks to Rossi, I no longer need to worry about making a living from painting. There are really only a few number of famous artists, most actually remain unknown and can never realise their dream during their lifetime. Vincent van Gogh, for instance, suffered when he was alive, but became huge after his death. What are your views on the relationship between art and business? One cannot expect to immediately make money from painting. But one shouldn’t think that artists have to live a life in deprivation either. Good artists will always be recognised by the market and have a certain value. I don’t think art and business are contradicting each other. There are some artists out there who feel particularly virtuous and avoid any contact with the market, while others try to aggressively pursue commercial benefits. I think both extremes are bad. Artists accept your value judgement. That is normal. For example, if Michelangelo had not been supported by the Medici family, mankind’s art history would be missing some extraordinarily amazing art works. We cannot always use van Gogh as a proof that artists should regard money as dirty, have to be unhappy and cut off their ears! You are exhibiting your work in Tibet, China and abroad. As an artist, which place do you like the most? I have only been to very few places and at the moment I cannot go anywhere. So I don’t have many choices, luckily I had the chance to go to Nepal many years ago, so I like Nepal. These old streets and old temples made me feel at home and I would like to live there permanently. –What about Lhasa, how would you rate Lhasa’s cultural life? –Does Lhasa have any cultural life? (laughs) I have not been to a nightclub in I don’t know how many years (laughs), I have no idea about Lhasa’s culture and art scene. –This is part of it, no? –Haha… We hope it is, but it isn’t much use. No matter how good the exhibition is, people look at it and forget about it again. No matter how big the event, people only remember it for about a week. How memorable can an art exhibition really be? Out of all the exhibitions that you have organised, which one has left the deepest impression on you? It would definitely be “Scorching Sun of Tibet” in 2010. It was planned by one of China’s greatest contemporary artists Mr. Li Xianting. 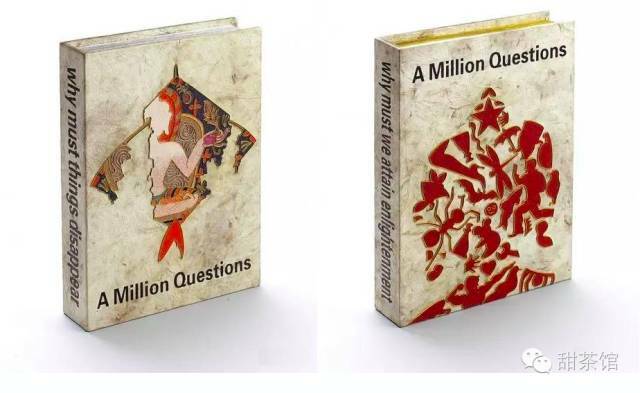 His academic status goes without saying and it was very important that someone like him, who assumes a formal and mainstream viewpoint, took an interest in contemporary Tibetan art. This exhibition was fundamentally different from previous Tibet themed exhibition in terms of its perspective and appearance. The world has always either admired or overlooked Tibetan art, but no one has ever approached it on an equal footing, it was never considered part of any artistic mainstream, but has always been marginalised, labelled as ethnic culture and regarded as exotic. I feel that this represents an unequal cultural attitude. So the fact that “Scorching Sun of Tibet” allowed them to look at and study our work on an equal footing has been very important in the history of Chinese contemporary art. In 2006, you placed a statue of Buddha made from ice into Lhasa river and used photos to document how it slowly melted away. More recently, you reconstructed the ice statue at the foot of Mt. Kailash, at the lakeside of Mapam Yutso. Where did you get the inspiration for this ice Buddha? And why did you reconstruct it in Ngari? I have talked about this ice Buddha too much, people even call me the “ice Buddha artist” (laughs). So in art you really cannot surpass yourself. If you happen to produce something very good and want to then produce something even better it is almost impossible. Always having to live in one’s own shadow can be really painful. 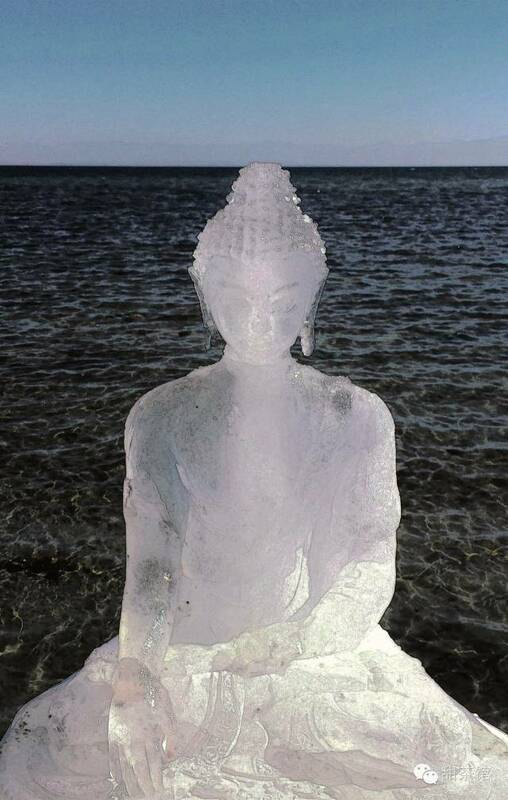 The idea behind this ice Buddha was to express the Buddhist notion of reincarnation. From nothing to something and then back to nothing; water turns into ice and ice slowly turns back into water; this is a kind of reincarnation. In the process of melting, the shape is constantly changing, it is a status of impermanence. But of course, there are many other interpretations of this piece. The artist is merely the creator, but the interpretation is left to the audience. The artist does not have the sole authority over the interpretation of his work. –I thought the piece represented global warming. –Yes, it can be interpreted as being about environmental protection, this is the nature of art works. Different people see different things: There are a thousand hamlets in a thousand people’s eyes. And the ice Buddha is really open to interpretation. As to why I reconstructed it, well, originally I should have used video recording to capture the melting process, but didn’t have the technology at the time. Plus, I suffer from extreme procrastination, never got round to doing it again. Ten years just passed in an instant. It’s frightening when you think about it. 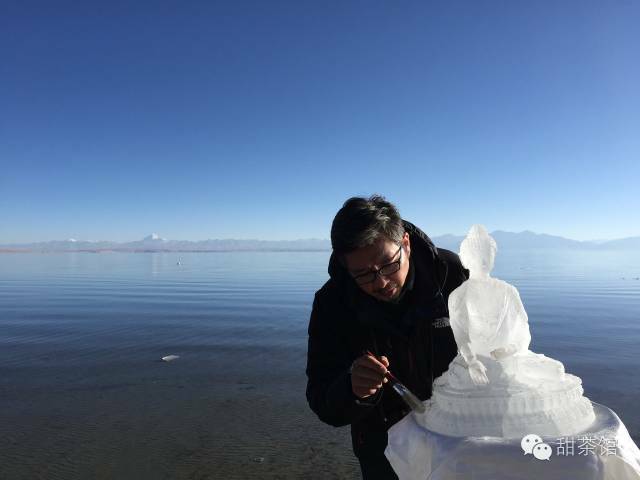 Another reason is that I have always wanted to place an ice Buddha at every important river and holy lake in Tibet. So I decided to place one at the lakeside of Lake Mapam Yutso. Finally, I would like to know which one would be the piece that you are most satisfied with, which piece was most difficult to produce and which one was the easiest? During every stage of my artistic career, there are different pieces of different styles that I am most satisfied with. Early on in 1997 there was “Spirit Beings on a Yak Hide Raft” in memory of my mother. I was really happy with that painting and have kept it all along, have never wanted to sell it. Then there is the “New Scriptures Series” from 2010, a collection of 108 pieces, which should actually be called “Fake Scriptures”. I used traditional drawing techniques for all of them but completely changed the content of the scriptures, including text messages, popular stories etc. From far away it looks like an antiquity, but from close-up it becomes completely new; this is what Tibet feels like, many people’s first impression is that of old, mysterious symbols, but once you live here, you will realise that it has totally changed and isn’t so different from the rest of China. The ice Buddha is another piece that I am quite happy with. Later on, the series of installations called “Making Gods”, including “the prayer wheel”, “the white book” or the “black scriptures”… the more recent prayer beads series is another one. I used prayer beads to make a heart and a sun; I find prayer beads interesting as a medium. They are full of people’s prayers and hopes, when you take up prayer beads, it is like immediately communicating with Buddha; similar to the mobile phone today, when you don’t have it you feel like being on an isolated island; when you hold prayer beads, you feel safe. This is why I decided to do something with them, I feel they have a profound meaning. In fact, I started working with them three years ago and have produced almost 20 items, but I am only really happy with three or four of them. The most difficult piece was a series of paintings that I did two years ago; I spent six months painting 12 hours per day until I started “vomiting blood”. I used many different techniques used for thangka. It was really distressing for my eyes. I came to realise how difficult the life of thangka masters must be, so next time you go and buy a thangka, don’t even think about bargaining (laughs). Recently, I try to paint smaller pieces, I don’t want to get myself into trouble anymore, you know I am getting old… hahaha. Finally, the “Bodhi Leaves Series” has been quite relaxing; I could finish one per day. When I had an idea I would paint, otherwise I would just leave it. But it’s important that it isn’t so demanding. I am planning to eventually complete a series of 108 bodhi leaves. –Ok, this is the end of the interview, thank you so much for your time. I was really happy to talk to you about contemporary Tibetan art and I really hope that more people will follow your group and contemporary Tibetan art. –I thank “Sweet Tea House” and you for this interview. As someone who was introduced to CTA in Lhasa by Ian, I started with one painting and then over the years of residence in Nepal, I have now a modest collection by Tibetan artists from Tibet, Nepal, India and hopefully soon the U.S. With a growing group of Tibetans both in Nepal, India as well as Europe and North America with means, instead of getting the latest Beemer or Merc, would it not be great to drive a VW or Subaru or Toyota and use some of the savings to acquire some CTA…The current levels of interest in CTA at an official level, leaves much to be desired…Here is where youth can really play a great role in promoting such expression….it appears that musically, there is a lot going on, some prose and poetry as well, but given the talent in art, a critical engagement would be great..on my part its a continuing education because by inclination, I am more word based..but the visual has opened up new ways of looking at realities and expression…onwards.. Thanks for your comment and for sharing your thoughts!